As I type this, it is snowing outside. In over a decade of living here in the States, I don't believe I have ever seen it snow like this in October before - I think I would remember if I had! I love the snow, and usually find the first snowfall of the year quite exciting... but this definitely feels a wee bit too early! While my little girl is at preschool and my little boy naps, I am stitching. Surrounded by autumnal decorations on display in our lounge, while snowflakes quietly float to the ground outside, I am busy finishing my summery Christmas decoration design that I'm getting ready to release. Hmm, no wonder I'm feeling a bit confused by the seasons at the moment! Have you started thinking about Christmas yet? What craft projects are you working on at the moment? 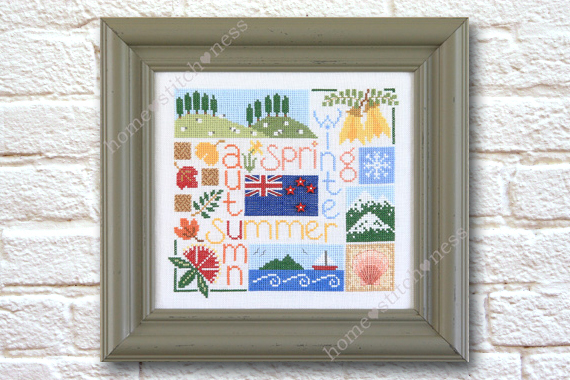 Hi Jenny, Your x stitch designs are gorgeous! I am always thinking about Xmas, I will dig out the festive CDs soon and start decorationg in November...sad but true!!! Enjoy your snow, it is just starting to warm up here,definitely hats and sunscreen. Thanks, Kim :o) I love Christmas too... the snow today has really made me start feeling festive, not to mention seeing all the pretty decorations you've been making lately!